Host of Country Fastball, a nationally syndicated country music radio program that began airing in March of 2007. Most of Robert’s guests are players from Major League Baseball who are country music fans and artists who are fans of baseball. Founder of “More Than a Ballgame”, a non-profit organization supporting the off-field interests and charitable efforts of baseball players and professionals. For 10 seasons, Robert hosted “Extra Innings” — the A’s post-game show. He took over the duties on a full-time basis in August of 2000. 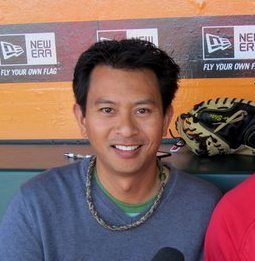 In addition to his on-air responsibilities, he worked for over 16 seasons in the Oakland A’s front office as manager of the broadcasting department and the A’s radio network. The eldest of 3 sons of Captain Mateo and Marilou Buan, Robert was born in Ft. Riley, KS and raised in Spokane, WA. He graduated from Santa Clara University with a degree in political science and minors in philosophy and French. His 3 children are Hannah (18), JD (10) and Ethan (8). Robert lives in Nashville, TN.